Do some small-business shopping today to help stop human trafficking. Shop Small Saturday is a day to support local businesses, and one way to do that is to pop in to CTX Coffee (11 N. Water) and have Briana Fruge stamp out a customized necklace for you. Even better, when you buy one of Briana’s necklaces (through her business called Abolition Avenue), you’re not just stamping out your name—you’re helping to stamp out human trafficking. In 2013, Briana Fruge was on a mission trip to Nicaragua, when she had a moment that nearly changed or life. Or maybe it did, but not in the way it was originally supposed to. While with a friend and at a market, they were being escorted around by someone who they thought was a member of the group they were with, there to act as a guide for the area. In a matter of minutes, things went from being pleasant to nearly going very wrong. They were being led down an alley, and Fruge was aware of the danger, but she says her friend was clueless as she willingly followed their “guide” down the otherwise desolate alleyway. Thankfully, another girl in the group caught their attention and turned them back. At that point, Fruge says the demeanor of their “guide” changed completely. He went from being smiling and helpful to scowling and distant. He soon left, and back with the group, Briana Fruge learned that he wasn’t a guide at all, and that the alleyway they were being led down was notorious for being a spot where girls went in and didn’t come back out. Back at home, Briana Fruge began to learn that Nicaragua was one of the worst in the world for human trafficking, but that it was hitting home as well. In her hometown near Dallas, human trafficking was not as overtly obvious, but that didn’t mean it didn’t exist. Fruge began to think about how she could help others and raise awareness. Through that, she founded Abolition Avenue, a jewelry company that exists purely to provide an avenue to abolish human trafficking. Abolition Avenue donates a portion of their sales to a few different organizations, including Rescue Her and Bochy’s Place. Both of which rescue and rehabilitate those who have been victims of human trafficking. 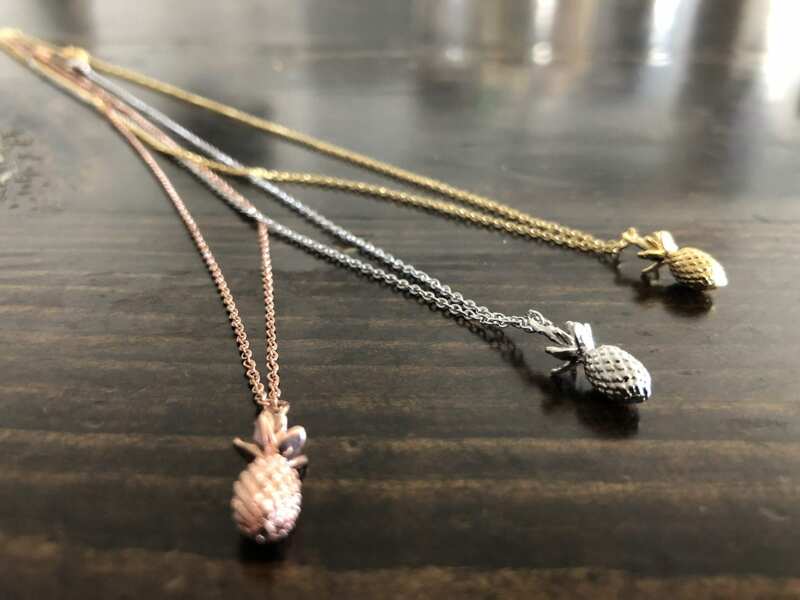 She chose the pineapple as the primary charm for her necklaces, as they are the symbol for hospitality. She encourages those who have someone in their life who has shown them hospitality to use this as the perfect gift to show their appreciation. Necklaces cost between $18 – $25 each (though there’s a rumored discount for fans of Sapulpa Times—hint hint!) There’s also a compass charm for what she calls the “wanderlust” edition, to keep travelers aware of human trafficking wherever they are. And for today’s pop-up shop, she’s creating customized stamped necklaces, that are stamped while you watch. All of these pieces are available in 14 karat rose gold plated over brass, silver plated, or 14 karat gold plated over brass. They’ll come with a 15″ to 17″ chain.